Part 4 of my railway modelling series brought the story up to the end of 2016, concluding with a note that I had mixed up the left-over Polyfiller I had been given. Unfortunately, I added too much water and thus it didn’t work particularly well. Over several more days, I layered on quite a bit of the additional filler I had bought. A week after I had applied it, the runny Polyfiller mix still hadn’t set (the new stuff was setting hard in under 24 hours). Since it was the leftovers of an old packet, I thought it may have got damp before I made it up and thus decided to scrape most of it off and redo it with my new plaster. Looking Tasty: while plastering, I had irrational thoughts that it might be nice to eat some of the plaster, perhaps because it looked similar to butter icing for cakes. With the new year and the end of the holidays it was back the day job, reducing the time available for modelling. Weekend landscaping works continued (the evenings are too dark) on the layout, for a while. The chicken wire mentioned in the previous post has gone missing; so I won’t be needing the wallpaper paste I bought. In hindsight there wasn’t room for much landscaping anyway, so once I had finished off the top of the main hill by shaping the filler into a few ‘rocky crags’ there was no need for much more. I wasn’t sure about the crags, but one of my brothers took a look and thought they were ok. His feedback wasn’t so positive on other aspects though; one side of my cutting was too step and he felt the hills were too ‘plonk’ at one end of the board, rather than spreading out more. I had originally planned to make the larger hill extend further onto the board, but my grandmother pointed out that would eat into space for the station; hence the design that was built. Bit-by-bit, I then started adding a rock-face effect to the cliff using foil (mostly Toblerone wrappings), scrunched up and then partly straightened, as a mould. I hadn’t got far with that before I discussed the steep side of the cutting with my grandmother. She agreed that it was too steep, so we took a chisel to it and reshaped it to a more-realistic profile, before I carried on with the rock-face effect. 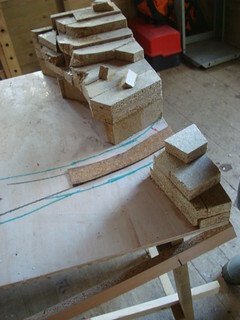 As the hills took shape, I started gluing down the rest of the cork tiles, cut to shape so that certain areas where there will not be track can be at a slightly lower level. I had only stuck three sections of cork when the PVA wood glue I had bought (and used on the chipboard) ran out. There may have been a little left that I couldn’t get out of the bottle, but even so that is almost 250ml of glue on my model already! Fortunately I had been given a large bottle of PVA labelled as being for sticking paper/card; I had intended to use that for ballasting in case PVA for paper isn’t the same as PVA for wood, but I figured it would stick the cork down alright too. Disaster Area: close-up of the section suffering from cracks caused by ‘artificial earthquakes’. It was rather thick, gloopy glue, way past it’s use-by date I suppose, but I went ahead with it and just hoped it would stick. Perhaps because of the thickness of the glue, the last few sections of cork needed a lot of extra weight to press them down, and I even had to resort to hammering the cork flat with a wooden mallet at some of the joins where the cork was jutting up above adjacent pieces. This hammering caused ‘seismic activity’ in the baseboard which broke off part of the plaster on the small hill side of the cutting. I fixed that, by re-attaching the broken plaster with more of the stuff, but there are still a number of cracks in that part of the hill, perhaps caused by further hammering (which may have been the chiselling of the cutting mentioned above). Once the Toblerone-wrapping work on the cliffs was almost completed, I started thinking a bit more about the design of the station area. I still haven’t decided whether I have space to expand the hill as my brother suggested, because I don’t know how big the car park will be, so I left a bit of the cliffs unfinished in case they get extended later. I did take a tape measure to our cars, to get an idea of how much space is needed, but never got round to scaling these down and making a parking-space-sized template to experiment with on the model. A combination of consultations to work on (principally the ones for the new Wales & Borders rail franchise) and general despondency given the cracked hill then put a halt to the project. Sorry, no dolphins: I don’t have any good Cardigan Bay / Wildlife photos, so here’s a train by the sea in Carmarthenshire instead. It seems nothing is safe. Late last year (2016), the Welsh Government announced that they would be allowing scallop dredging across the Cardigan Bay Special Area of Conservation (SAC). How are we to know what untouched, natural seabed looks like if it is periodically ‘dug up’ by scallop dredging equipment? We can’t do so now, because beam trawling also disturbs the seabed and this, apparently, has been permitted throughout the area for some time. What is the point of giving something ‘protected status’ if destructive practices are allowed regardless? This matter is not, you may think, on-topic for this blog; but Cardigan Bay isn’t the only example of ‘protected status’ not meaning much. Four Sites of Special Scientific Interest (SSSIs), and the River Usk SAC, would be impacted by the second M4 motorway around Newport backed by the Welsh Government. It is not just the Welsh Government that is ignoring valuable wildlife habitats either, on the 3rd of February 2016 the Woodland Trust pointed out on the radio that HS2, as-planned, would destroy ancient woodland. Wildlife protections are not the only ones being overridden either. The Museum Of Science and Industry (formerly abbreviated as MOSI and now as MSI) in Manchester incorporates two grade 1 listed buildings. One of these is Manchester Liverpool Road station, the original terminus of the Liverpool and Manchester railway (the world’s first locomotive-hauled passenger line between two cities). While the old station is no longer used by service trains, until recently it was still connected to the national network allowing occasional visits by present day rolling stock, and the museum ran demonstration rides around their site hauled by a steam engine. 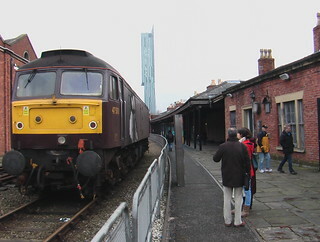 However, as part of the Ordsall chord project the connection to the national network was cut off, which also restricts the available track for the museum’s internal trains. Admittedly, the project does not actually destroy the listed building and the impact on the museum’s services was probably unavoidable in order to deliver improved national rail services. However, I feel the Ordsall chord should have been designed with a flat crossing to allow trains from the national network to run into Liverpool Road station occasionally. While my views on the Ordsall chord could be considered a ‘minor quibble’, since trains wouldn’t use the link into the museum very often, there are listed buildings elsewhere that appear to be treated as though they had no such protection. A case in point is Cardiff Central. The station was listed as the most complete major city GWR station of its time, and currently looks well looked after. However, the plans for its future suggest otherwise. Clock Clobbered: Among other parts of the building (such as that currently home to M&S), the clock tower is gone in Powell Dobson’s horrendous plans for Cardiff Central. Listed building consent has already been granted for electrification at Cardiff Central. While I am in favour of electrification, I do think the Overhead Line Equipment (OHLE) designs Network Rail are using on the Great Western scheme are far more visually obtrusive than necessary. On sections where speeds may reach 125mph the heavy-duty structures are perhaps justified, but surely structures of that scale aren’t necessary in and around Cardiff Central, where speeds are much lower. It appears from the listed building consent application that most of the OHLE structures Network Rail are planning to install are a standard XL TTC design with chunky masts of square cross-section. I think that means Extra Large Twin Track Cantilevers, but there are enormous portal structures spanning many tracks at the ends of the platforms too. It is all very square in modern-industrial style with I-beam sections etc. completely out of keeping with the existing cylindrical columns holding up the classic platform canopies. Elsewhere on the GW, Network Rail have come up with a more-subtle design of OHLE especially for Bath’s Sydney Gardens. It isn’t perfect, and I’m not sure they’ve finalised the design, but with elegantly-arching tube-section masts it is a least a good effort; whereas in Cardiff they’ve gone for the standard brutish monstrosities. So far, the only successful consideration of the listed building I’ve found in the plans for Cardiff is that a small degree of care has gone into choosing sites for the outrageous masts (avoiding placing one directly in front of the station name). Because of that, Network Rail’s ‘school report’ from me would be ‘should try harder, shame on Cardiff council for not pressing them to do so’. Deplorable Destruction: Another illustration of the extensive demolition planned at Cardiff Central. Architects ‘Powell Dobson’ fare much worse. If the headmaster was strict, they would be expelled (or sent back to elementary school). Surely, the obvious thing with a listed building is that you do not demolish it, yet that is exactly what their plans for a major refurbishment of Cardiff Central seem to involve. Although it is obvious at first glance that the current northern frontage is retained, a closer inspection reveals that vast swathes of the current station would disappear. Even northern concourse building would have a large hole knocked through one side of it in the plans and the structure on the other side (currently home to M&S) is gone completely, along with the station clock it appears. The platform buildings, all of them, and canopies could also go; there would be little left. Again, although a planning application has not yet been submitted, the council seem to be complicit in this blatant disregard for the station’s listed status. Far from criticising the poor design, the powers-that-be appear to be busy pressing for the project to happen as soon as possible. Bags Of Character: the beautiful station building at Fishguard & Goodwick station, now demolished. You could say that the version of Cardiff Central which ‘Powell Dobson’ have designed is still on the drawing board and may never happen. 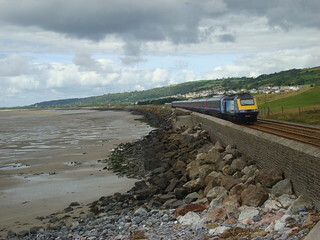 Granted, there is (I hope) time to stop the destruction, but just look at Fishguard & Goodwick station. Although it is not listed, it is within a conservation area which apparently was deliberately designed to include the station. 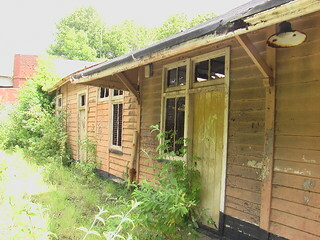 Despite this, the characterful station building there was demolished in its entirety. Yes; it was falling down anyway and yes a replacement building was constructed but this failed to capture any of the character of the original. The materials used in the new build are all wrong, the chimney stack is missing and the shape of the canopies isn’t quite right. The replacement building doesn’t do the original justice; not one little bit. 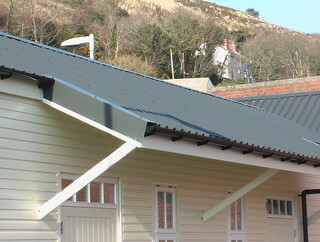 Mad Materials: close-up of the new building at Fishguard & Goodwick, showing the wrong roof and wall materials and crazy angle of canopy supports. If something is given special protection it should be protected, end of. This isn’t happening currently, something needs to be done or more treasures will be lost. This post is timed, almost by-chance, to coincide with WWF’s Earth Hour 2017 (25th March, 20:30), so I will end with the following: If we don’t protect the climate, one of those treasures might be life itself (at the very least, some species would go extinct as a result of climate change). Part 4 of my railway modelling series. While the legless board was lying in the house following the events of part 3, a couple of shopping trips were made. On the first, I picked up a shiny new length of flexible track. The metal-cutters I had tried on an old length of broken flexible track produced very untidy results so, at the same time, I also bought a track-cutter to use on the new track. As well as ‘IT guy’ I am also ‘furniture assembler’ at work; the desks come packed with four strips of chipboard (roughly 2in by 1in cross-section) and I already had collected quite a few of these. At home, I had been given a small amount of chicken wire and Polyfiller, but this was not going to be enough to landscape my model. The aim of the second shopping trip was there to obtain materials for scenic development. I picked up some more plaster along with some PVA wood glue and cork tiles for laying under the track. I thought I would probably need some wallpaper paste too, so bought some of that as well. Before commencing the messy work, I marked out the position of the track on the board, and rolled one of my longest items of rolling stock over the layout to mark the overhang on the curves. I then realised I wouldn’t be able to see these markings once I laid the cork. Fortunately, my grandmother had a bright idea; once I had lifted the track she produced a large amount of ‘tracing paper’ (I think it was actually baking parchment or greaseproof paper, given that it came on a roll in a cardboard box) and I copied the markings onto that. Going back to the track-lifting; this was necessary to avoid getting scenery-building material all over, and proved to be a challenge. Despite the fact I had left part of the track pins protruding, they took quite a bit of effort to pull out. When the pins eventually came up they did so suddenly and violently, taking the track with them and bending the fishplates joining the rails to the next (still fixed-down) piece of track. I hope only the fishplates are bent, not the track itself. 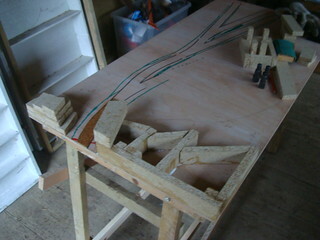 The bare baseboard was then taken back out to the shed and the legs re-attached. 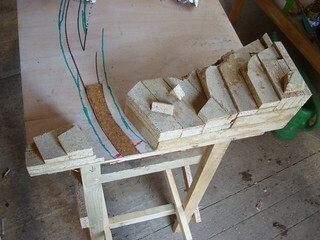 Over several days, I then constructed the underlying structure of the hills at one end of the baseboard using the free chipboard gathered from work. A lot of sawing and gluing was necessary, and I wasn’t able to get a lot done each day partly due to the limited length of daylight (there is no electricity in the shed) but mostly because I kept having to leave the glue to dry. Before I could glue the bottom layer of chipboard to the ply surface, I had to cut and fix the first small section of the cork base for the track (this can be seen in the photos, running through the cutting). 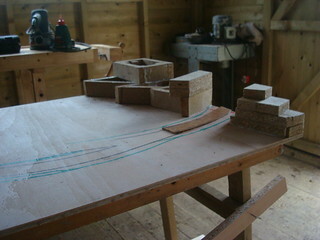 Top View: the completed hill structure from above. Finally, on 29th December, I completed the gluing of chipboard. On the 31st, I mixed up the left-over Polyfiller I had been given and made a start on trying to round-off the hills. More on the that will follow in the next instalment.